So this evening I went through most of my yarn bins. I took pictures of a lot of stuff to upload it on Ravelry. On one hand, I was comforted to find that my stash was not as vast as most people think it is. But on the other hand, I have lots of single skeins of things that I have no idea what I’m going to do with it. In this photo is one of my favorites. It’s Cherry Tree Hill Oceania. I bought it about two years ago, when there was this half off sale so I got a really good deal on it. Of course I have no idea what to do with it. Along the way there was a small pile of UFOs that I rediscovered for possible finishing. There were even a few that I kissed goodbye, including a French Market Bag that I had started with some leftover oddballs that didn’t really go together, and a mini triangular scarf out of some leftover Noro Silk Garden. 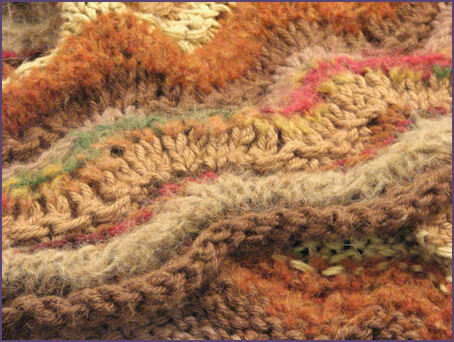 The Silk Garden yarn had been used to make a Knit Round Scarf by Sally Melville. (The link takes you to the book at Knit Picks. If you click the “View More Images” button from that page, you’ll see the scarf in the second group of pictures. It actually looks more like a wrap to me…) Anyway, I made it, but was totally unhappy with it being totally in stockinette stitch and then being all curly on the edges. I changed the neckline to a ribbing, but the bottom edge still rolls of course. Well I couldn’t just throw it out because it was made with such expensive yarn and all. Well, Diana, who was probably only 6 or 7 at the time that I made it is now almost 12 and the thing looks just darling on her! Glad I found it today. I’ll have to snap a photo of her wearing it and post it so y’all can see. Diana was so excited that she wove in the remaining ends herself. We also found a scarf that she liked that only needed ends weaved in and some fringe added. So she started on that, too! So not all of my UFOs are lost causes. Yay! 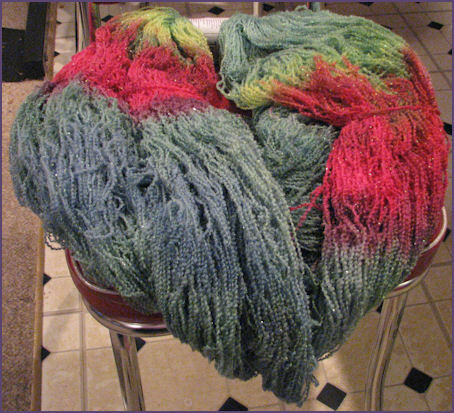 For the last one I am hoping to find a yarn with long color changes like Noro Kureyon, but that isn’t Kureyon, because I hate the way it feels. I’m thinking maybe a Trendsetter yarn. I’ll have to see. Here’s a closeup of the blanket today… couldn’t resist. More soon, I hope! It’s an Addiction, I’m Tellin’ Ya! I shoulda’ known something was up when the Namaste Executive Bags began disappearing a couple of months ago. I thought to myself, I had better grab one, now. So I did. Like an idiot. If only I had waited another month. How was I to know they were coming out with something even better? Introducing, my Namaste Cali Collection Laguna Bag! I loved my Executive, for about a minute, until I tried to jam my WIP afghan into it. It just didn’t really fit. I don’t know if it’s because this bag is softer, or what, but it holds the afghan, and my obnoxious, oversized wallet with shoulder strap, with actual room to spare. There’s even a zipper pouch in the middle — woo hoo! It’s big enough to hold all of my knitting notions. And they’re not going to fall out like they would have out of the inside pockets of the Executive. That one only has elastic on the pockets. 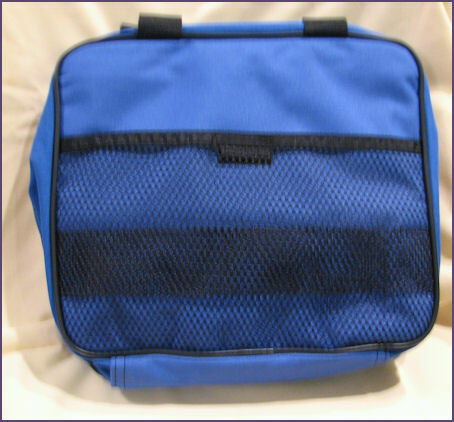 (Yes, the Executive has a SIDE that is zippered, but that is where, presumably, one would put one’s wallet and personal stuff. My notions were in the other pockets and were constantly falling out because the bag wouldn’t close because my project was too big for it.) 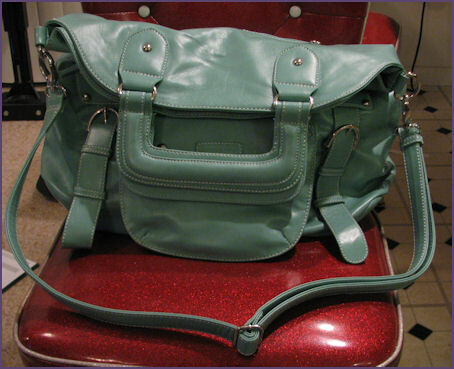 And it has a shoulder strap. So I can hang it on the back of my chair if I need to. 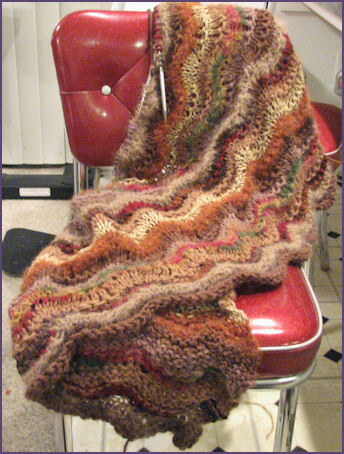 Did I mention that the afghan fits inside, AND it still closes? A bag big enough for this had eluded me. Here’s a photo with my afghan tucked inside and my obnoxiously large wallet peeking out on the other side. No, it’s not even completely full. I am suitably impressed. Finding a bag big enough to hold my stuff has been a big challenge. And here’s a closeup of the magnet closures. When the bag isn’t quite full, the top of the bag sort of folds over on itself. If it’s quite full, it is more completely upright, as shown in the first picture. Yes, even with the afghan inside, the top of my bag still folds over. I only propped it up for the picture. I think I am in bag lust! Help me!! And as if this day could NOT get any better, my Spring ’08 issue of Interweave Knits arrived today. Is this Nirvana? Ok, last one! This photo was shot in dimmer light and is probably more true to the color of the bag. Thanks to the folks on Ravelry for asking! 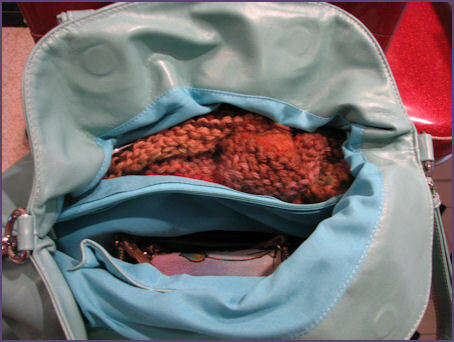 Ok, this is going to sound crazy, but on the Knit Picks discussion board on Ravelry, folks started talking about finding a better way to store their Harmony needles. Someone mentioned that they found a “worm binder” at Wally World and that it was a perfect fit. Now, I don’t go browsing the fishin’ pole section every day, in fact, never, so I had never even heard of one of these marvelous contraptions. Yesterday, I braved a throng of tween girls at the new Hannah Montana movie, and it just so happens that at this mall where my favorite theater is, there is an Outdoor World store, that includes a Bass Pro Shop. Lo and behold, there they were! 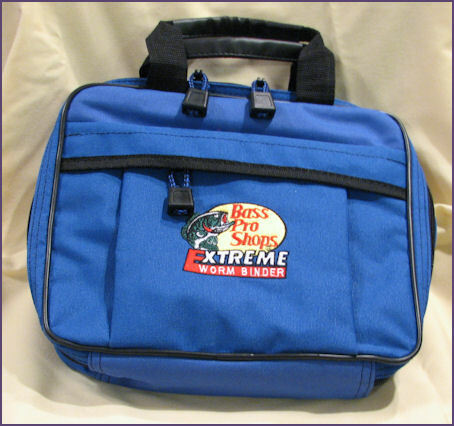 But alas, the one I found in the store, and bought fairly immediately, is not available online — yes it is, here’s the link: Extreme Worm Binder (Mine is the “medium” size.). 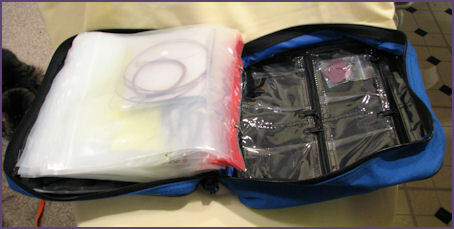 The bag is made of some sort of waterproof fabric, and includes lots of little ziploc bags (for fishing tackle) inside. 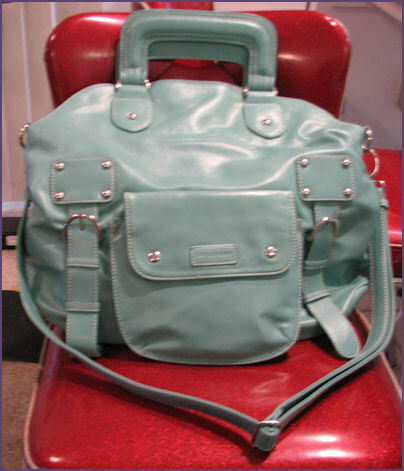 The outside has a zipper pocket, and because the bag itself is soft sided, it is really very roomy. 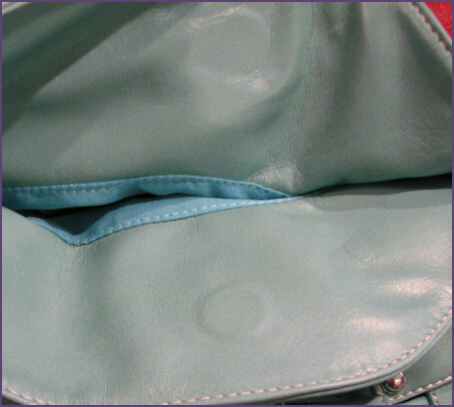 Here is a view of the inside front cover, showing two zipper pockets. They are the perfect size for my needle sizer, scissors, or whatever else I need to carry. And here is the inside back cover, which has quite a few small pockets, perfect for end buttons, stitch markers, the little “key” thingys that help tighten the needles, etc. And this is the back cover, which has a mesh pocket with a velcro tab for holding it closed. Overall, this bag is great! 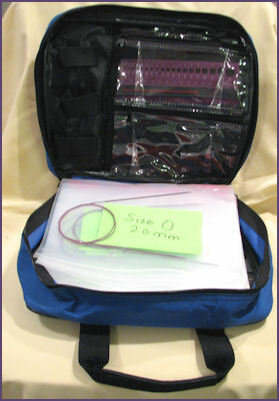 All of my needles fit in there, which is more than I can say for the bag that came with my Harmony set. (Ok, there’s enough room for one pair of each of the interchangeable tips in the bag that the set comes with, plus you can throw cables and stuff in the center section, but then where would I put my fixed circulars that are sized 0 to 3? especially since the 1’s and 2’s have two sizes each, and the needle sizer doesn’t have holes for each of these. I would have a devil of a time telling them apart. PLUS, I have multiple pairs of tips for my favorite sizes, and now they will all fit in the ziploc bag things. It’s great that I can keep all of my needles together. So, I highly recommend a fishing worm binder (also called a tackle binder or a bait binder) as wonderful knitting needle storage. I should have gotten more than one. The only thing is I hope I can somehow remove the Bass Pro patch off the front and replace it with something a little more “girly”…. My dad would be rolling his eyes at me if he could see this!